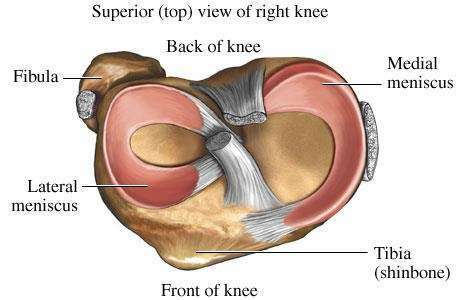 Injuries to the knee meniscus are one of the most common injuries seen in the knee joint. Due to this relatively high prevalence, there have been advances in our understanding of these injuries and the most effective management options. The aims of this guide are to provide you with information about meniscal injuries and the management options that are currently available. The menisci are specialised structures within the knee which play an important role in joint stability, shock absorption and joint lubrication of the knee joint. With a tough firbocartilage composition and high water content, they are designed to cushion the knee and withstand a high degree of pressure through the joint. Injury to the menisci can reduce the shock absorbance capacity and stability of the knee joint leading to pain when walking, performing activities of daily living and participating in sports and exercise. 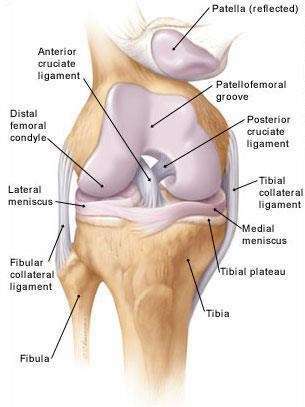 The knee joint comprises of two menisci, the medial meniscus (positioned on the inside of the knee) and the lateral meniscus (positioned on the outside of the knee). The menisci are crescent-shaped structures that sit directly in between the tibia (shin bone) and the femur (thigh bone). They attach to the top of the tibia creating a cup for the femur to sit in that aids joint stability. There are some differences in the shape and position of the medial and lateral menisci. The medial meniscus is larger and more elongated. It is more commonly injured than the lateral meniscus because it attaches directly to the medial collateral ligament and joint capsule, and is less mobile than the lateral meniscus. The blood supply to both menisci is poor, with blood flowing only to the outer edges. This results in a poor ability for the menisci to heal once injured. Tears to the outer edge of the menisci have a better blood supply and therefore have a greater potential to heal. The front part of each meniscus is called the anterior horn; the middle section is called the body and the back portion the posterior horn. The picture below is looking down onto the top of your tibia (shin bone) with the thigh bone taken away. How are the menisci injured? Acute meniscal injuries occur when the knee is suddenly twisted and forced forward into a bent position whilst the foot is still in contact with the floor. A portion of the meniscus can be torn by this combination of twisting and compression forces on the knee. These injuries are seen commonly in sports that involve twisting and turning, for example, rugby or football. The menisci can also develop degenerative tears. These are tears associated with repetitive stress on the meniscus rather than one traumatic event to the knee. The meniscus can weaken and become less elastic over time causing small tears to form which can eventually become larger and more problematic. This type of injury is more common in older patients. What are the signs and symptoms of a meniscal injury? Acute meniscal injuries usually result in immediate pain followed by a gradual build up of swelling in the knee and limited movement. The pain reported is usually well localised to a particular aspect of the knee joint with an associated catching sensation during movement. Sometimes the knee can also lock in a position if a part of the meniscus gets trapped within the joint. Degenerative tears may present with similar symptoms to an acute injury, although on occasions patients may only experience pain without noticeable swelling or movement restrictions in the knee. An experienced clinician (such as a consultant or physiotherapist) can usually diagnose meniscal tears by listening to the history of the injury and examining your knee. An MRI (Magnetic Resonance Imaging) scan may be performed to assess damage to the ligaments and menisci. An MRI scan is 70-90% accurate. An x-ray may also be performed to assess for any degenerative (wear and tear of the lining) changes within the joint such as arthritis, but an x-ray will not show if a meniscal tear exists. What is the treatment for a meniscal tear? consideration. These factors will all help guide the consultant or physiotherapist when deciding the best management for the injury. The options available are conservative treatment with physiotherapy or surgery. Again, the decision on which management is most appropriate will be guided by the type of injury sustained. If surgical management is indicated, the operation will take place by way of an arthroscopy. 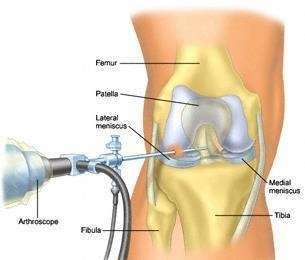 A small fibre optic camera is inserted through two small incisions on either side of your kneecap tendon. The camera allows the surgeon to accurately view your knee joint and perform the surgery with minimal disruption to the knee. The procedure is normally performed under a general anaesthetic and surgery will take approximately 30 minutes, usually as a day case or occasionally with an over night stay in hospital. The surgical procedure performed will depend upon what the surgeon finds during the operation. Where possible the consultant will always try to repair the torn meniscus. This is only possible in fresh tears and tears that are in the outer 1/3 of the meniscus where there is a good blood supply. The torn part of the meniscus is sutured so that it can heal. If the meniscus is torn in the middle 2/3, where there is no blood supply to the meniscus and therefore little capacity for the meniscus to heal again, a partial meniscectomy is performed instead. This procedure involves removing the torn part of the meniscus and leaving the remaining parts of the meniscus alone. One of the important roles of the menisci is to spread your body weight over as big an area of your knee joint lining as possible. If the menisci are injured and can no longer do this properly, then areas of your joint lining are put under more load. Sometimes the lining is put under too much load and can slowly deteriorate over time eventually leading to loss of the lining of the knee. This is called Osteoarthritis (OA). The risk of developing OA in later life may increase if you have a meniscal injury whilst you are young or if the injury means a large amount of meniscus is lost. Wherever possible your surgeon will try and preserve as much meniscal tissue as possible to minimise this risk. What will happen after the operation? Following the operation you will wake up with a small dressing around your knee. You will be allowed up once you have recovered from the anaesthetic. If you have had a partial meniscectomy you will be allowed to fully weight bear as pain allows straight away. movement in your knee in order for the meniscal repair to heal. Your surgeon will decide if this is necessary. The use of crutches is sometimes required after the surgery. The knee may be swollen and bruised, so you should keep your leg elevated when not walking or exercising. The use of ice is also permitted if the knee is swollen. You should leave the ice on for no longer than 10-15 minutes at a time. Please note that you should not place an ice pack directly on the skin but you should place the ice in a damp towel before you apply it. A physiotherapist will give you some simple exercises whilst you are still in hospital to help with your recovery on returning home. The types of exercises following partial meniscectomy may vary from those following a meniscal repair. This will be explained to you by the physiotherapist before you go home. Out-patient physiotherapy should begin approximately one week after surgery. When will I see my consultant following the operation? If there are any complications with your rehabilitation your physiotherapist may refer you back to your consultant for a further review and will liaise directly with the consultant about any issues. If you have had a meniscal repair you may be required to attend a follow-up at around two weeks from surgery. Infection (<1%) can almost always be treated with antibiotics and usually just involves the skin. If bacteria get into the knee itself then it may be necessary to do a further arthroscopy to wash the knee out with saline solution and give stronger antibiotics via a drip. Deep vein thrombosis (DVT, <1%) is a complication of any knee surgery but is unusual if early mobility is encouraged after surgery. Stiffness will always be present in the early post-operative phase but usually disappears with exercises and physiotherapy. When do I start rehabilitation? Your rehabilitation begins immediately after your meniscal tear surgery. Initially you will be seen by a ward physiotherapist on the day of your surgery to make sure you get back on your feet safely before you go home. You’ll also be given some simple exercises to get you started. It is recommended that you then arrange to begin your out-patient physiotherapy at the end of the first week following surgery. When arranging your out-patient physiotherapy you should choose an experienced physiotherapist with expertise in knee rehabilitation. It’s the role of this physiotherapist to guide you through your recovery safely and ensure you achieve the best outcome following surgery. The time it takes to recover following meniscal surgery varies depending on whether you have had a partial meniscectomy or meniscal repair. Following a partial meniscectomy the recovery rate is usually quicker than a meniscal repair. This is because the repaired meniscus needs time to heal and so a period of protection early on after the surgery is necessary. Regardless of the type of surgery performed, one of the biggest factors that will determine the rate of recovery and long-term outcome following surgery is your motivation and adherence to rehabilitation. Full recovery following partial meniscectomy is usually within six to eight weeks and meniscal repair three to four months. The rehabilitation following meniscal surgery is split into three different phases (early, middle and late). Within each phase there are specific goals that your physiotherapist will help you to achieve. Once you have achieved all the goals in each phase you will be able to move on to the next phase of your rehabilitation. The time it takes to progress to the next phase will vary from person to person, so the timeframes that have been included in these guidelines are only an approximation. When considering a return to driving following surgery it is essential that you consider the safety of yourself and other road users. After one week it is usually safe to return to driving if you have had surgery to the left knee. Within this timeframe you will have regained sufficient mobility and strength in the knee to use the clutch pedal. Following right knee surgery the time to return to driving is usually slightly longer. It may take two to four weeks for the right knee to be strong enough and react quick enough to use the brake pedal in the event of an emergency stop. You will be advised by your surgeon or physiotherapist when it is safe to start driving again but you should also check with your vehicle insurer to confirm you are covered. The time when you can return to work depends entirely on the type of work you do. If your job is sedentary, for example desk-based work, you should be able to return within a few days after the surgery. If your job requires you to be on your feet for longer periods of time, but does not require manual duties such as heavy lifting and kneeling, you may return to work within two to three weeks. Jobs that require a greater degree of manual work and physical demand, for example lifting and running, may require four to six weeks or more following partial meniscectomy and up to three months or more following meniscal repair. Again, your surgeon or physiotherapist will give you advice on when to return to work. Opinion amongst experts regarding when it is appropriate to return to sports following surgery is variable. People recover at different rates for many reasons and so the return to sport criteria is based on an individual’s physical and psychological readiness to return to their sport, rather than based on a set timeframe. Following a partial meniscectomy you may be able to return to road cycling at two to four weeks and jogging or light individual sports, for example non-competitive golf, at four to six weeks. These timeframes are doubled following meniscal repair. The time it takes to return to high performance/contact sports, for example rugby, football and skiing, following partial meniscectomy, will be six to eight weeks or more. Again, this time frame will be doubled for meniscal repair.